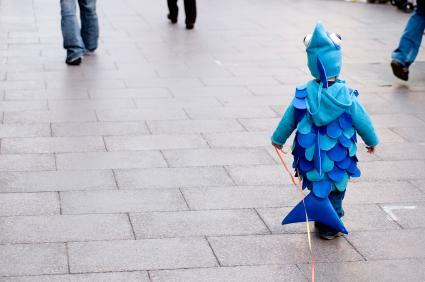 Whether you need an adult-sized fish costume for your next party or want to create an aquatic-themed Halloween outfit for that special little one, fish costume patterns are a great way to create the perfect look. Use printable sewing patterns to make a fish costume from scratch, or embellish some existing outfits to give them a little fishy flair. If you need help downloading the patterns, check out these helpful tips. This pattern is simple, and you can adjust the size to fit everyone from toddlers to adults. You won't need a lot of sewing experience for this costume, especially since it uses stretchy fabric. It's very simple and forgiving. Expect to spend a weekend working up this design, or less if you're an experienced seamstress. 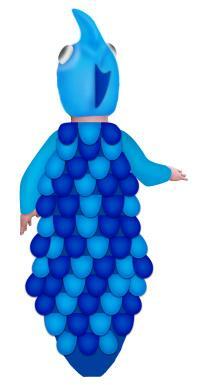 Print this free fish costume pattern. 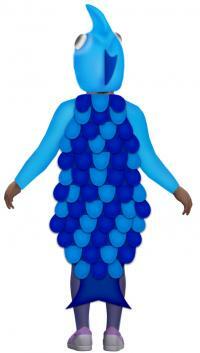 The amount of fabric you'll need for this fish costume will depend on the size of the person who will wear it. Simply measure loosely around the person's chest, just beneath the arms. Divide your measurement in half, and add one inch. Then enlarge this printable pattern to fit your measurement, and purchase the amount of fabric you'll need. Print out the fish costume sewing pattern, enlarged to the appropriate size. Cut out the pattern, and pin the body and hood pieces to your stretchy fabric. Placing the right sides together, pin the shoulder seams and side seams of the body panels. Use a zigzag stitch on your sewing machine to sew these seams, leaving a quarter-inch seam allowance. Set aside. Pin the top curved seam of the hood pieces, and sew this seam with a zigzag stitch. Leave a quarter-inch seam allowance. Placing the right sides together, pin the bottom of the hood to the back of the body piece. Use a zigzag stitch to sew the seam, leaving a half-inch allowance. Do not sew past the shoulder seams of the body piece. Fit the fish costume to the individual who will wear it. It doesn't matter if it's a little tight in some places and loose in others, since it will be covered in scales. It just needs to be comfortable. If necessary, make minor adjustments to the fit, such as enlarging the neck opening. Use the zigzag stitch to reinforce the bottom hem, arm holes, neck opening, and hood opening. You don't need to hem anything. Pin the fin pattern piece to the dark blue felt, and cut out four fins. Stack two of the fins together, and pin. Use your sewing machine to top stitch along both curving sides of the fin, stopping one inch from the straight side on both seams. Fold open the one-inch opening on the straight side, and pin the fin to the back of the fish costume hood. Sew along both sides to affix it to the costume. It should be standing up like a dorsal fin. Attach one of the remaining fins under each arm. These will be slightly floppy. Don't worry too much about how neat your stitches are, since these seams will be covered in scales as well. Use the tail pattern piece to cut a tail out of light blue felt. Attach this to the bottom hem of the costume at the back. Now you're ready to cut out the scales. The number of scales you need will depend on the size of your fish costume, but you should cut enough to let them overlap slightly. Cut the scales out of both colors of blue felt. Beginning at the bottom edge just above the tail seam, sew the scales to the stretchy fabric. Leave an inch or two between each scale to give the costume plenty of room to stretch. When you've finished the first row of scales, move up a few inches and put on the next row. Try to stagger the scales so a minimal amount of the stretchy fabric shows through. When you've covered the entire body in scales, continue on to the hood. Finally, it's time to add some eyes. Cut large circles out of the white felt and smaller circles out of the black felt. Stack them together to make a fish eye, and hand sew each eye to the side of the hood. Experiment with the placement to get a look you like. Print this infant fish bunting pattern. Need a fun costume for the littlest member of your family? You can turn your baby into a little guppy with this easy bunting pattern. This pattern is made of fleece, so it's extra cozy. It's also very simple and shouldn't take more than a day of sewing. Print out the pattern and enlarge according to the instructions. Cut out the pattern pieces. Pin the back and front pieces to the light blue fleece, and cut them out. Pin the front zipper seam of the bunting, right sides together. Baste this seam using your sewing machine, leaving a one-inch seam allowance. Fold open the seam on the inside, and pin the zipper in place. Use your sewing machine with a zipper foot to sew the zipper into the seam, leaving half an inch at the top neck hole. When you get to the bottom edge of the zipper, reinforce the remaining few inches of the seam with smaller stitches. Use the seam ripper to open your basting stitches, and test the operation of the zipper. Next, pin the front of the bunting to the back of the bunting, right sides together. Beginning at the underarm, sew down the side seam, around the tail-shaped bottom, and up the other side seam. Then sew the shoulder seams. Leave a half-inch seam allowance. Hem the arm and neck holes, clipping the fabric as needed to allow it to take on the appropriate shape. Don't worry if your work isn't perfect. This entire costume will have scales covering it. Cut the bunting tie piece out of dark blue fleece, and tie it around the bottom of the bunting, just above the tail. This will help define the tail shape. Securely knot the piece, and then use your scissors to round the ends slightly. They will blend in with the scales. Use the scale pattern piece to cut lots of scales out of both shades of blue. Start at the bottom of the bunting, just above the bunting tie, and begin sewing the scales to the body row by row. Overlap each row slightly with the row below it, and mix the shades of blue together. When you get to the zipper, be sure you don't sew any scales over it. Continue sewing the scales on the costume until you reach the shoulder. Measure your baby's head, and add one inch to this measurement. Cut a rectangle of fleece that is the length of your measurement and about eight inches tall. Hem one of the long sides of the fleece rectangle. Fold the rectangle in half with the short sides together. Turn this right side out. You'll have an open hat. Place the hat on your baby's head, and pin a curved top seam from the front forehead to the nape of the neck, taking care not to poke the baby with pins. Take the hat off your baby, and sew this seam where you pinned. Trim the top seam in the shape of a dorsal fin. Cut large white circles and smaller black circles to make the fish's eyes. Hand sew these on either side of the hat. You're done! Use a clear plastic umbrella, and attach pieces of ribbon all around the edge of it. Dress in all white and hold the umbrella over your head for an easy jellyfish costume. Instead of making the torso portion of the basic fish costume in the sewing pattern, use an old T-shirt. Attach scales directly to the T-shirt. Or, if you're really in a hurry, use fabric paints to make the scales. You can make a cute fishbowl with a cardboard box, black paint, cellophane, blue construction paper or cloth, fish cut-outs (seaweed, fish, seashells), glue, and a dark-colored outfit. Cut a hole in the top of the box for a child's head and an armhole on each side of the box for the child's arms. Draw a fish bowl on the front and back of the box, and cut two large circles out of the blue paper or cloth, which will serve as the water in the fish bowl. Glue one circle to the front and back of the box. Glue the cut-outs of the fish, seaweed and seashells to the blue paper or cloth, arranging them in a realistic manner within the fishbowl. You can make a fish head mask with some paper mache, a large balloon, glue, paint, and paper. Make sure the balloon will be about twice the size of the person's head who will be wearing it. Cover the balloon in paper mache, working one layer at a time. When the mask is completely, pop the balloon. Then cut the appropriate sized neck opening in the fish head, and decorate the head with paints to make the fish scales, mouth, and eyes. Don't forget to cut eye holes and a mouth hole for the wearer's comfort. Even if you use a fish costume pattern to create your costume, add some of your own personal style to your aquatic look. Consider decorating your costume with sequins, glitter, and other fun embellishments. There are no strict rules about what a fish costume should look like, so have fun expressing your creativity.